I love the way Calvin Miller can turn a phrase. He writes very well. He has some deep thinking, but his writing style makes it very accessible. And, in "Into the Depths of God" he tackles the subject of spiritual experience that many call mysticism.All too often, Christians writing about mystical experience fall into Universalism. So, I was very interested to see how Calvin Miller, a very solid evangelical pastor and theologian, would explain this subject.Overall, I think he did an excellent job of writing about Christian mysticism. He maintains a strong connection to Christian identity as he explores and expresses the depths of God.In two chapters I had to disagree with him. He writes about the connection between good, high quality art and spirituality. While I enjoy art, I think it does a disservice to all Christians to connect art with spiritual experience in the way that Miller does in this book. Why? Because when I read the New Testament I don't see anything lacking in their spiritual experience and I also don't see anything that can be called fine art. The other chapter with which I disagree is the chapter that deals with music in relation to spirituality. This chapter almost sounded whiny at certain moments - we don't sing the great hymns enough any more. That wasn't his point, but it came across that way some. I see music differently as it relates to spiritual experience and spiritual expression. When the heart is right it doesn't matter whether one is singing a good hymn or a good praise chorus.The whole rest of the book is excellent. His concluding chapter on death and spirituality is absolutely fabulous. How should the Christian view death? Most of us do not view it the way Scripture presents it, and that is Miller's point. When we enter into the depths of God we will view death as the Bible presents it.Here is how Miller describes it, "When we are home at last, the homesickness will be over. We shall praise the King who knew how to cut eternal doorways in mere holes cut in sod. "I love the way Calvin Miller writes. I thoroughly enjoyed Into the Depths of God. I am really interested in the mystical side of spirituality. In this book Miller points to a way of life which acknowledges a calmer, deeper and more profound state of faith we can live in. It was refreshing and rewarding to read. I learned a lot and was challenged to observe a quieter centre while on the surface coping with the every day bustle of life.I hope this book is taken up and chewed on slowly because it merits careful and thoughtful reading. I really like Miller’s style and have read a lot of his books. “Once upon a Tree” and “The Path of Celtic Prayer”. An amazing book that was referred to me about knowing and trusting God with my whole heart, examining my motives for everything, enjoying God and the beauty of His creation, breaking away from earthly pleasures, expressing praise, confession of sin and so much more. I highly recommend this book for those who want to get to know God better and are serious about obeying His Word. Simply describes how the Church has lost its Mystic roots, and has become a busy machine, and how it needs to return to its First Love, and to let God out of the Box we have put him in! I really enjoyed this book, as I pondered Calvin's musings. Calvin Miller writes beautifully, and is great to quote. Unfortunately, he gets a bit repetitive - I didn't finish this book because it started getting a bit repetitive and too nebulous, even though it is good writing. one of my top 10 of Christian growth books. each chapter was enlightening, challenging & provoking. Not your typical read. Calvin Miller is an excellent, insightful writer & a 'difficult' guy. I loved my time spent with him! Love, love, love Calvin Miller. An insightful read. We lost a treasure when Calvin Miller "graduated" to heaven this year. So glad we still have his books! It is wonderful! Every Christian should read this book. One of my all-time favorite books. 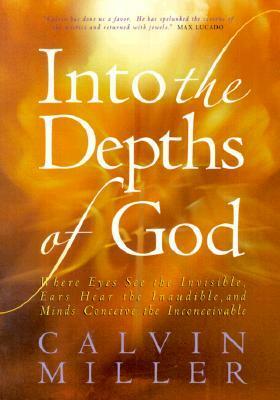 Calvin Miller - Calvin Miller has written over 40 books of popular theology and inspiration. A former pastor, he is professor of preaching and pastoral ministry at Beeson Divinity School in Birmingham, Alabama. He and his wife, Joyce, have two grown children.